Photo credit: Patrick Pyszka, City of Chicago. Mayor Rahm Emanuel and Chicago Transit Authority (CTA) President Forrest Claypool unveiled new 5000-series railcars, manufactured by Bombardier Transportation Corp., marking the first time there has been an addition to the rail fleet since 1992. Following a successful prototype testing period, the first of 706 brand new, full production model cars will debut on the Pink Line. As more cars continue to arrive, they will be tested internally to ensure all components are operating properly before going into service. The total cost of the railcars is $1.137 billion, which is funded by two CTA bond issuances backed by sales tax receipts. The remainder is paid for by $150 million in federal funds. Emanuel and Claypool were joined for the inaugural run at the Midway station on the Orange Line by representatives from Bombardier Transportation, the manufacturer of the cars. 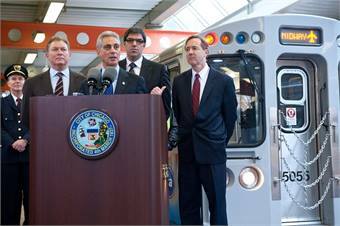 "The CTA remains the primary mode of transportation for many residents of Chicago, and these new railcars reflect the agency's commitment to its customers and to our city," said Mayor Rahm Emanuel. "In order for Chicago to grow, continue attracting new businesses and increase the quality of life for all Chicagoans we must continue to invest in public transportation, improving transit infrastructure and expanding service." The railcars feature an aisle-facing seating configuration, which adds six inches to the narrowest portion of the aisle, allowing more room for customers carrying backpacks, packages, luggage, strollers and bikes. The aisle-facing seating also provides space for an additional wheelchair position, increasing the total to two per car. Each railcar has multiple security cameras and will eventually transmit real time video to CTA's Control Center, the Office of Emergency Management and Communication, and the Chicago Police Department. CTA's Control Center will also have remote access to signs, giving them the ability to make emergency audio and text messages inside the trains if needed. The addition of these new cars to the fleet will allow CTA to retire some of its oldest cars, which average between 32 and 41 years of age.